Samaria. ca. 375 to 333 BC. Silver obol. Rare type. Date : Qedar dates this series to between 375 and 333 BC. Reference : Meshorer & Qedar 100. Size : 8.4 x 9.3 mm. Weight : 0.48 grams. This is a small coin. Grade : gVF/XF, but slightly off-centre on both sides. Dark gray patina which appears to be an original hoard patina. 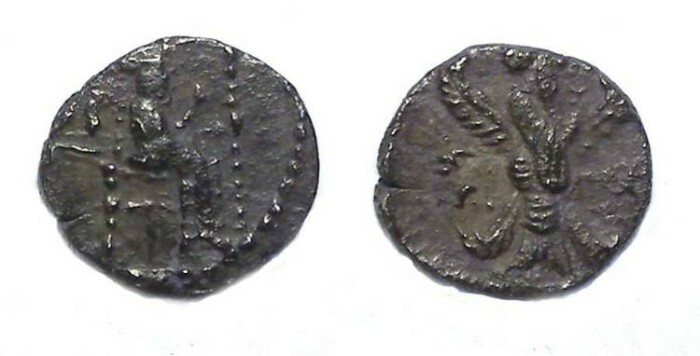 Value : This type does not appear to be in coin archives, and so I would assume it be to fairly rare (all Samaria obols are at least scarce). Other far more common types (as many as 5 examples in coin archives) with related types, sell in the $300 to $450 range, so I have prices this apparently much rarer type (none in coin archives) slightly higher. Obverse : Persian King seated on throne with tow aramaic letters to the right that are probably equivalent to SN. Reverse : Diety (?) with a man's head that lookes very much like a Persian king, four wings and a birds tail, standing right, with two Aramaic letters representing MZ to the left.